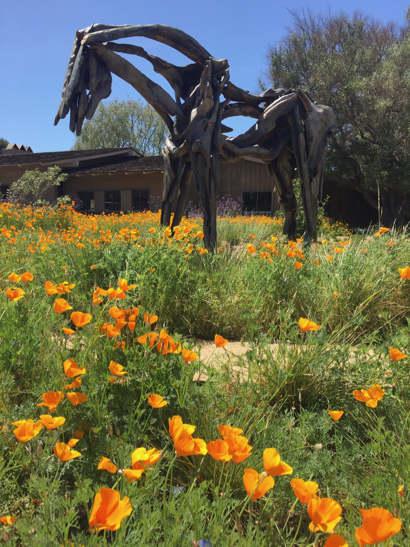 This we know: the horse made of sculpted wood appeared first at the corner of Willow and Middlefield roads after Sunset vacated its two headquarter buildings in Menlo Park. Who put it there, why it is there, and the name of the artist who sculpted it, we do not know. Maybe one of our InMenlo readers has the scoop. These days it’s surrounded by a blaze of spring poppies. InMenlo contributing photographer Frances Freyberg captured the horse from a couple of different angles when out for a walk. I haven’t checked this one, but while the one at the Cantor looks like it is made of wood, it is actually bronze. Butterfield often casts her horses in bronze. She collects drift wood, makes molds of the various pieces, and then casts the piece in bronze, with a special finish that makes it fool our eyes into thinking it is wood. Some of the life size ones are wood, while others only look like wood, and are actually bronze, a more permanent material. These sculptures look like wood, but are cast bronze.